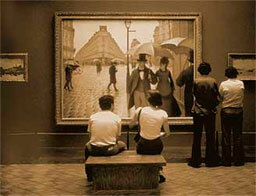 Pictories are photopaintings that combine words and images to tell stories of modern life. Both the words and images are based in truth, but both contain elements of fiction. The pictures begin as photographs, and then I edit them and paint on them with my computer. I frequently combine multiple images, add or remove elements and symbols, and change colors and textures. The text is based on stories from people I know or stories from the news. I change the names and dates, and, as with the images, I add or remove elements and symbols, as well as change colors and textures of the words. All that we know about ourselves and the world around us is based on what we learn through our five senses. We are like televisions with only five channels. While most of us are well-educated when it comes to sight and sound, we are never taught how to use our other three channels, smell, taste, and touch. So most of us go through life watching only MTV and ESPN. We miss so much! To get the most out of life we must use all our senses. If we go through life using only two channels we are handicapped. Once upon a time in a previous life I wrote more than 500 articles about food and drink as a columnist for the Washington Post, the Chicago Tribune, and editor of a wine magazine. I had the opportunity to travel the world and use all my senses. I even had a traveling exhibition of my photos debut at Robert Mondavi Winery. Here are some stories about food and drink I have collected through the years. The title for this wing of my gallery is "Never Drink Water," named after the photopainting above. In Brussels, just off the Grand Place, there is a famous fountain with a little boy, well, squirting into the water. It is called "Mannequin Pis." No translation necessary. In the shops nearby you can buy replicas and postcards of this naughty little cherub. They even sell corkscrews with the helix, well, you know where. But my favorite copy is in the gardens of Laurent-Perrier, the great Champagne producer in the middle of the vineyards of Tours-Sur-Marne, just south of Reims, about 75 miles east of Paris. 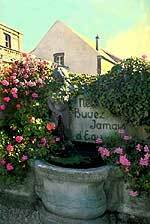 The inscription reads "Ne Buvez Jamais d'Eau" which, loosely translated, means "Never Drink Water."